"What are you waiting for?! Go get her!" 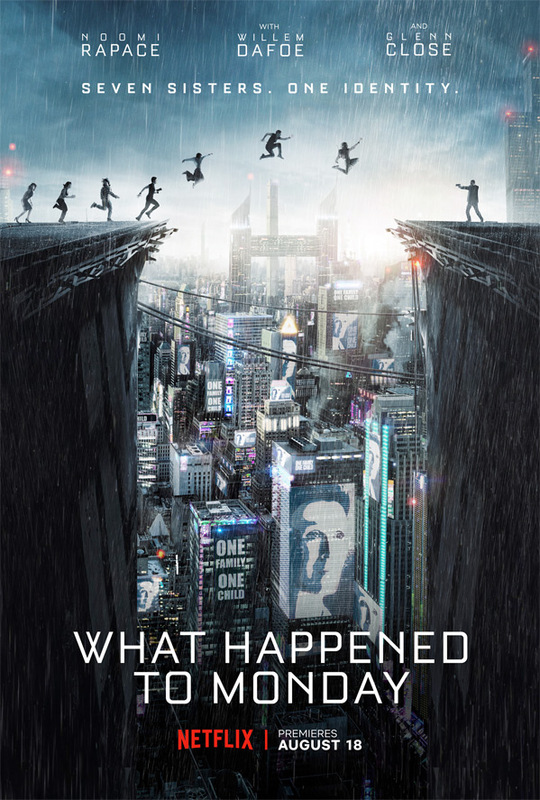 Netflix has debuted a new official US trailer for indie sci-fi film What Happened to Monday?, going by Seven Sisters in some countries (we posted another trailer for this film under this name a few months ago). This is set in the near future when governments have enacted a "One-Child Policy", but a family of seven sisters outwits the societal policy by existing in secrecy. Noomi Rapace plays all seven sisters, each with a different identity, and each named for the days of the week - Monday, Tuesday, etc. They go out one-by-one each day pretending they're the same person, and everything seems to be going fine until one day Monday doesn't come home. The cast includes Willem Dafoe, Glenn Close, Robert Wagner, Marwan Kenzari, and Pål Sverre Hagen. I actually saw this movie recently, and it's damn good. It gets a little weird, but entertaining throughout and Rapace is impressive as always. In a not so distant future, where overpopulation and famine have forced governments to undertake a drastic One-Child Policy, seven identical sisters (all of them portrayed by Noomi Rapace) live a hide-and-seek existence pursued by the Child Allocation Bureau. The Bureau, directed by the fierce Nicolette Cayman (Glenn Close), enforces a strict family-planning agenda that the sisters outwit by taking turns assuming the identity of one person: Karen Settman. Taught by their grandfather (Willem Dafoe) who raised and named them - Monday, Tuesday, Wednesday, Thursday, Friday, Saturday and Sunday - each can go outside once a week as their common identity, but are only free to be themselves in the prison of their own apartment. That is until, one day, Monday does not come home. Seven Sisters is directed by Norwegian filmmaker Tommy Wirkola, of the films Kill Buljo: The Movie, Dead Snow 1 & 2, and Hansel & Gretel: Witch Hunters previously. The screenplay is written by Kerry Williamson and Max Botkin. Netflix will release Wirkola's What Happened to Monday? streaming exclusively starting August 18th. Interested?